It is time to share my photos from the photo challenges I am participating in! 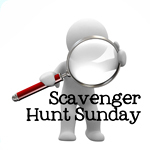 Let's start with Scavenger Hunt Sunday, shall we. It appears what LEAVES are left were covered with some frost and a small amount of snow last Sunday on the way to the Bills game. We had a blast with our impromptu "photo shoot" over at the park last week. I needed this picture of A HAT and I remembered we had this hat from VBS. It has last the rim around the outside, making it appear like it is falling apart, but I quite like it as it is. It sort of reminds me of a scarecrows hat or something. So, We the children had a bunch of fun posing and just having fun with this hat. I plan on sharing more in my Wordless Wednesday post, but I chose picture featuring each child to share here. At first the only thing I could think of to do for STOP was to take a picture of a stop sign. Then we went over to the park and I had this cute idea. Have one child stand there and have another child run at her and have her raise up her hand to signal her to STOP. MY TOWN is a small rural town where the walk around town measures about 1 mile. Unfortunately, there aren't sidewalks all the way around, which is really annoying at times. However, the children love balancing on the curb and walking in the grass. On this walk we were measuring how far we could go in 8 minutes, because that is how long it takes the light from the sun to reach the earth. Looking UP at the top of this bare tree against the cloudy sky made for a neat picture. I didn't mean for it to be a "spooky" picture, but I have been informed by a couple of people that it is. I am still participating in the three photo-a-day challenges. I did fall a bit behind when it comes to posting the pictures though. I didn't have a chance to get all caught up or make my collages, so I am going to post a separate Round Up post later. It wa lovely to engage the children in your photo shot and they did so well.I love that last shot. Somoody and I cannot beliwve you have frost already! Hope you are having a good week.